Wear DermaSox straight from the pack as normal sock use. Each pair last 30 days providing hydration & moisturisation treatment for dry, hard skin on feet. Thereafter socks can be worn as normal foot-wear. Sports-cut design, for 'no show' can be worn underneath normal day socks or on their own. 2 pair-pack gives full 60 days treatment. Gentle hand wash, NO bleach, air dry away from direct sunlight, and direct heat source. 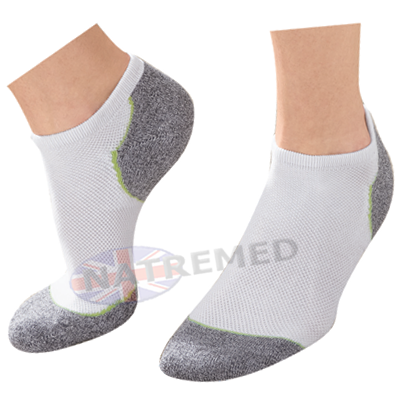 NEW to the UK Dermasox are a unique treatment sock, designed specifically for diabetics, They are seam-free for comfort and to avoid friction. Easy-stretch fabric made of natural Bamboo will glide onto foot, close and soft. Suitable for diabetic foot-care and sensitive skin. Extra fabric on areas of stress zones where further protection is needed the most. CONTINUOUS MOISTURE & HYDRATION ...The treatment formula of Aloe Vera, Shea Butter and Vitamin E is micro-encapsulated into the fibres of the sock, which slowly release to hydrate & moisturise your feet keeping the skin soft, smooth and protected. Innovative moisture technology created by foot and skin care specialists from UK Lab. UK patented formula from Celessence Technology. Independently tested for efficacy and safety. Transdermal-D moisture formula releases treatment from socks only when worn. Capsules are impregnated into fibre via a process of micro-encapsulation and are time-released for delivery. Nano-Bamboo charcoal filtering areas (Shown in grey) are designed with extra fabric for more intense treatment is needed most. 2-pair pack for full 60 days moisturisation. Helps with circulation and keeps feet warm and comfortable. Treatment only released on use, long lasting. Wear 6-8 hours a day for best results. 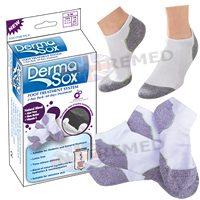 After use, Derma-Sox are great for every-day wear. Hand wash with mild detergent, dry naturally away from direct heat source.